UNITED NATIONS, July 17 -- When NBC's Richard Engel exited the UN Security Council on Wednesday after advising Council members to distinguish between journalists who deserve their protection and activists, “Tweeters” and state broadcasters who don't, Inner City Press asked him a question. And then Engel was gone, as Security Council members continued “debating” the matter. South Korea and Australia urged more protection for bloggers, for example. But another of the initial speakers, Kathleen Carroll of Associated Press, neglected to make an obvious point: that the US government, which holds the UN Security Council presidency for July and scheduled this debate, spied on AP. Doesn't this bring up another form of protection that journalists need? Engel said that state broadcasters were not journalists, given the example of state TV in Syria. When asked about Voice of America he said that is somehow different. Inner City Press has recently covered that debate, here -- but note that Voice of America's editor Steve Redisch wrote to the UN asking it to “review” the accreditation of Inner City Press. Documents begrudgingly obtained by Inner City Press under the US Freedom of Information Act -- since VOA is a state broadcaster -- show that VOA said it had support for this request from Reuters, Agence France Presse (represented Wednesday in the Council) and even the UN Correspondents Association, click here for more on that. French Ambassador Gerard Araud scheduled and then un-scheduled a question and answer session at 11:30; the new Free UN Coalition for Access (FUNCA) asked his mission what France has done on the case of Chadian blogger Makaila, so far without answer. 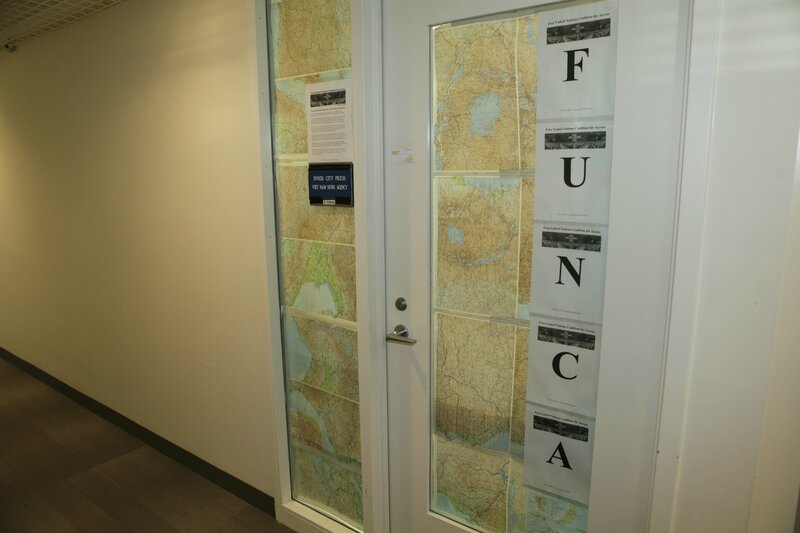 FUNCA was established to protect journalists, defined more broadly than Richard Engel proposed, from these type of attacks. The UN's response? To threaten to suspend or withdraw the accreditation of Inner City Press for merely hanging a FUNCA sign on the door of Room S-303, a story up from the Security Council. One form of protection of journalists was discussed in the UN Security Council Wednesday morning. But many other forms were not. Watch this site.